Preserving the History and Culture of Tatong and District. every Second Month, being every Odd month. 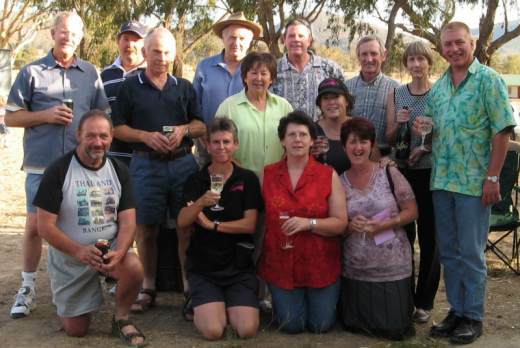 and the Benalla Family Research Group. 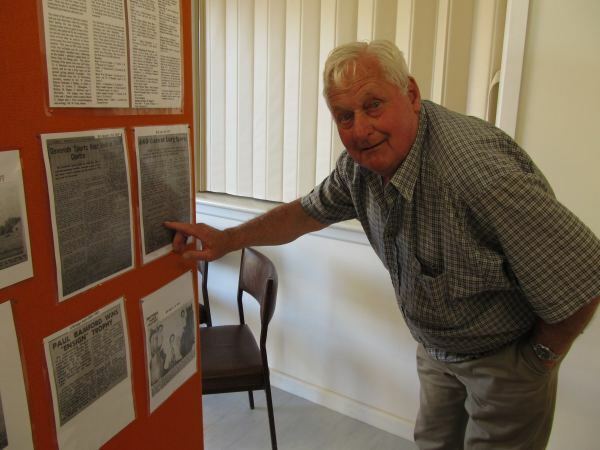 Barry O'Connor, who initiated and facilitated the project, has compiled a booklet which lists those individuals marked, and some of the information found by the researchers involved. The booklet can be download here, as a PDF. 2.2MB. on their way to the Southern coast in 1824. Photo courtesy the Harrison collection. Where were Davy Falls, Tatong? 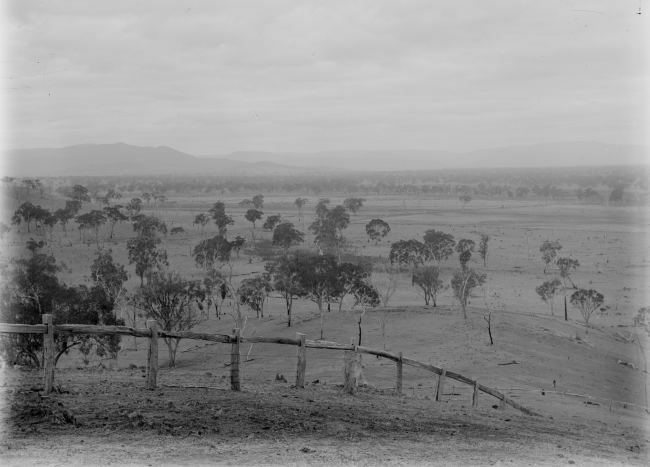 This photo listed in Trove shows a scene from c. 1890. 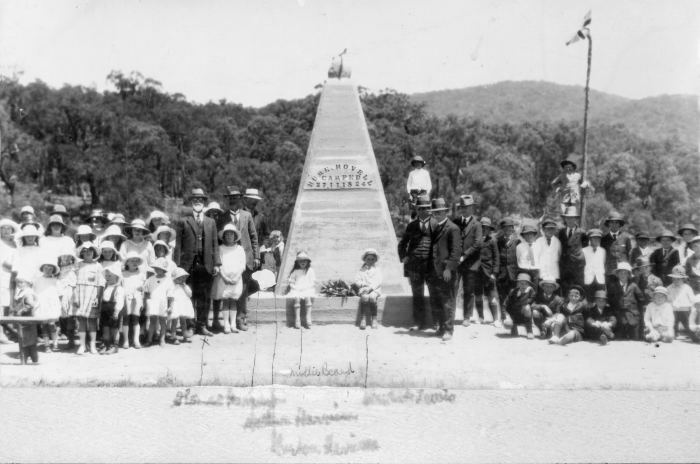 W. H. Ferguson, who was taking a series of photographs of "Gippsland and the Victorian high country". He took a few of Tatong district. Janet Hauptman guesses it may be taken from Mt Pleasant. When the temperature drops it will be followed up upon - we need the modern version to compare it with. Below is a Shrunk version, but the original is very high resolution - glass plates are wonderful. When the original is studied in full resolution, the number of fallen & dead trees is remarkable. 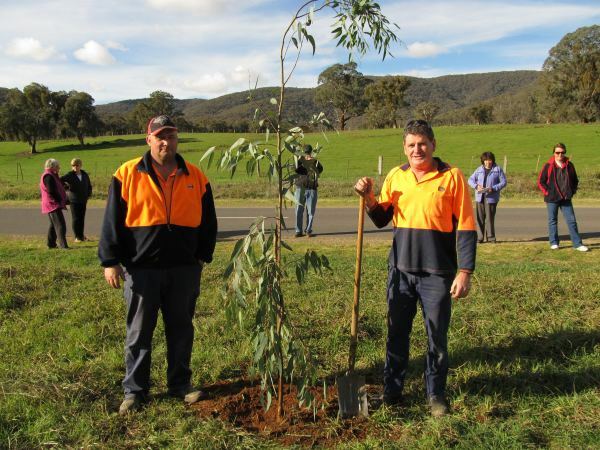 In June a Clone of the Hovell Red-Gum was planted at Wrightly, North of Tatong. 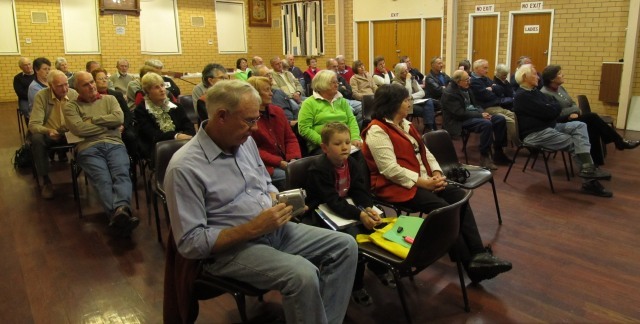 The Tatong Heritage Group hosted a “Samaria District Oral History Night”. Our guest speaker, Mr. Barry O’Connor, has been engaged in research for the Samaria C.F.A. There are not many "Samarias" around. 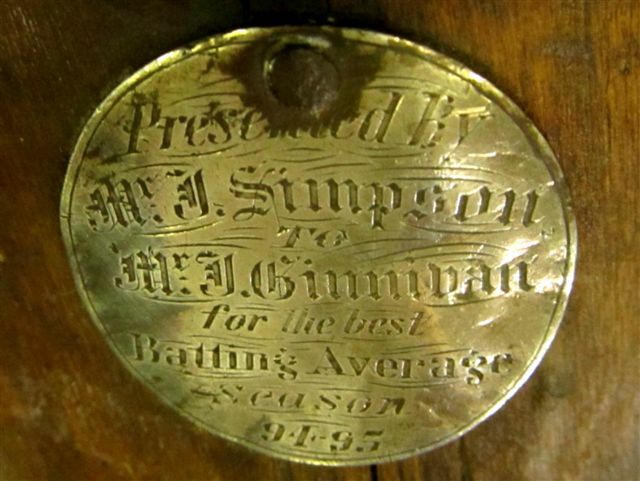 This badge is on Leo Ginnivan's grandfather's cricket bat. Barry O'Connor spoke of some of the confusion on the origin of Samaria and Moorngag. And Mt Verdon. 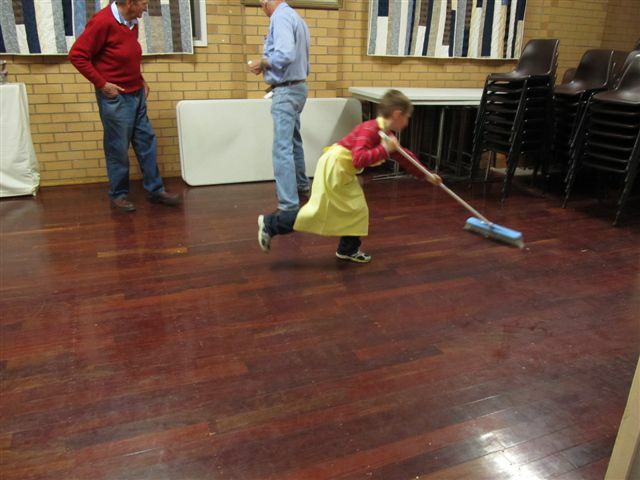 And young Jack did a fine job of helping clean up afterwards. 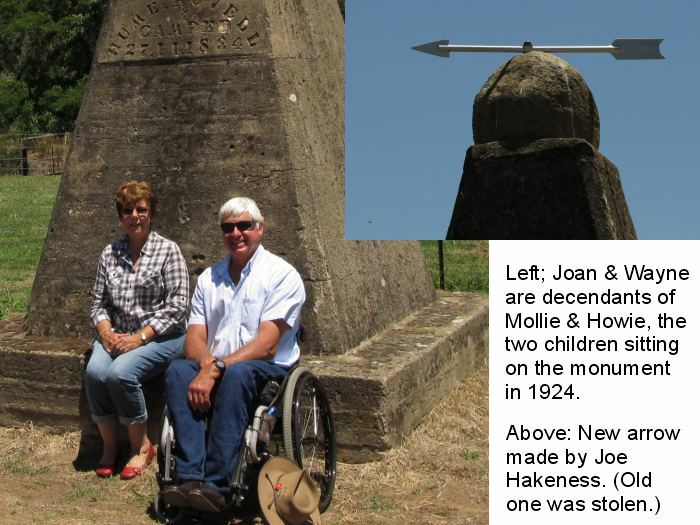 "The History of the Molyullah and Upper Ryan's Creek District, 1879 - 1879"
Danny Delany won the 75 yards in 1957. "One of Ned Kelly's Post Offices. 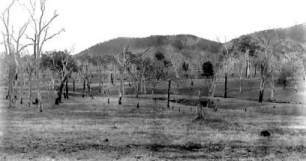 - The hole in this embankment served as a place where the bushranger could leave and collect communications: it is situated at Tatong, about 20 miles from Benalla." It was situated by the Tatong-Tolmie Rd, near Riverview. Local legend has it that Kate Kelly left food and newspaper reports there for Ned. Was it really Ned Kelly's Post Office Box? We will never know for sure. When the road was re-aligned in the 1950's or 60's, this area was destroyed. 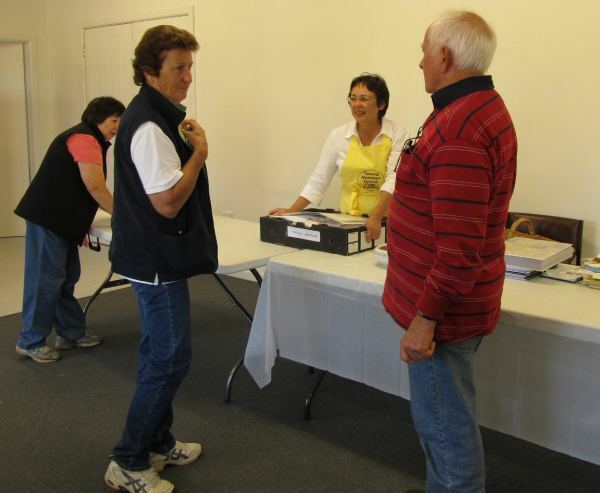 Incidentally, Chick observed that she cannot locate any Benalla district newspapers from 1880. There has to be a good Conspiracy Theory here. Local Legend also holds a far less pleasant recollection. 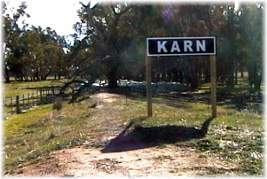 In the mid-1800's, in the Barjarg area, the locals feared an attack by local aborigines. The story goes that the locals killed a bullock, and invited all the local tribes to come to a peace-making feast. They came, they feasted, and they died - about 300 people died according to one version of the story. Probably to strychnine poisoning. This miserable tragedy should not be forgotten. As George Santayana said, "Those who cannot remember the past are condemned to repeat it." Any further information on this legend will be sadly welcomed. Heather, Joe and Bev at the Hall, January 2011. At the December market - beautiful weather if a trifle windy. 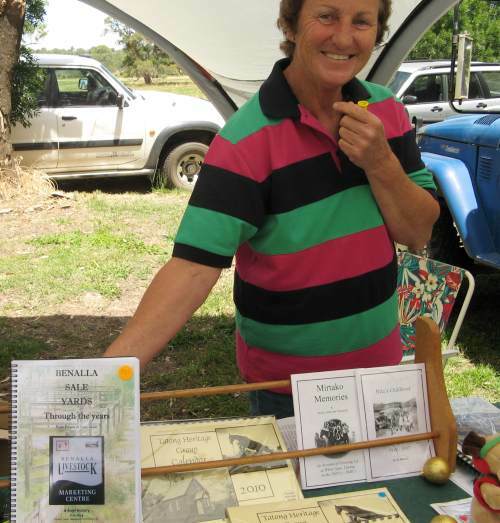 Chick Walker with her new publication on Benalla and District Saleyards. 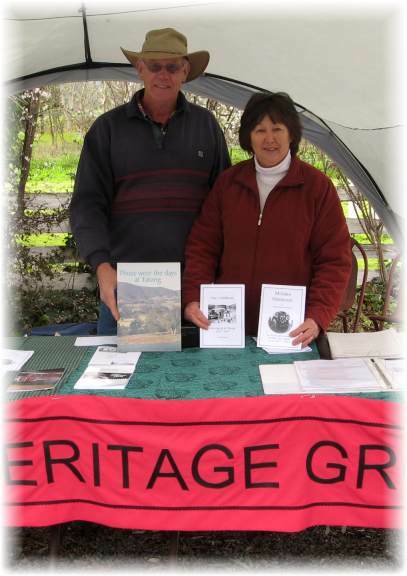 Joe (treasurer) and Bev (assistant Secretary) at the Tatong Market kast September. A chilly day but with coffee & bacon sandwiches available, who cares? 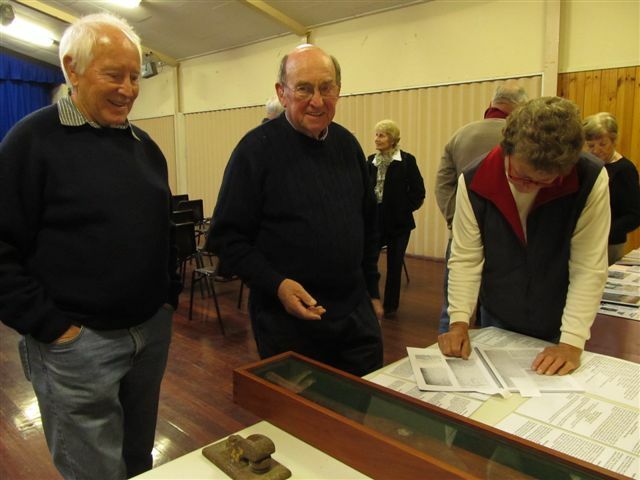 The group has a variety of historical pieces on display & for sale. 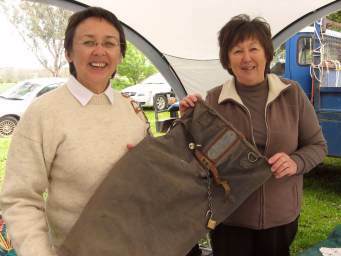 Heather and Bev with the mailbag Rosemary and Nita used to use, now generously donated to the Heritage Group. Note: Meetings are held in the Tatong Memorial Hall. The Self-Drive Map is updated to show the new plaques; these mark & give information on the the Sawdust Kiln, the site of St Albans Church, the Police House, and the Timber Trolley. The map can be always be downloaded from the "Visitor's Page"
Chick Walker and Les MacLean are making signs for some local historical sites. 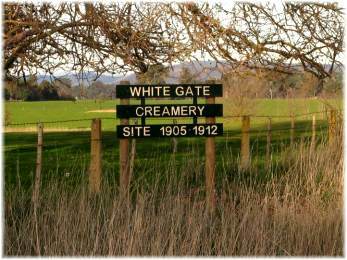 Beginning in White Gate, Les has routed, painted and (with some help from his friends) set up some outstanding markers, such as this for the site of the White Gate Creamery at Elm Tree Corner. 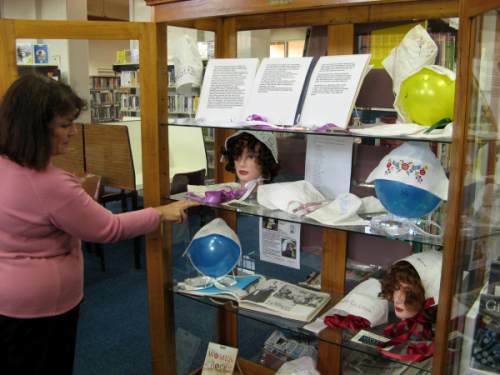 For August 2009, the Tatong Heritage Group put on a bonnet show in the Benalla Library's display Cabinet. Information sheets explained the bonnet project, and many of the lovely bonnets made by people of the Tatong district decorated the shelves. is a project innovated by Christina Henri in Australia, and now convict women all over the world are being remembered. 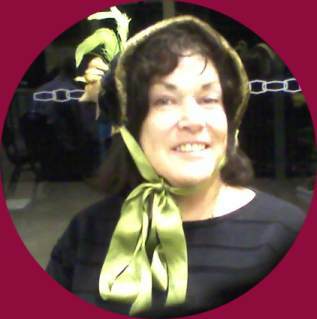 As of August 2008 she has had 11,000 bonnets made and donated, towards her goal of 25,566. Next year she will hold a second Victorian Blessing of the Bonnets. Her bonnet pattern can be downloaded by right-clicking BonnetPattern.pdf (470kb) and selecting "Save Target As". She comments that Kevin Rudd's paternal fifth great-grandmother, Mary Wade, was transported to Australia when she was just 12. Check her website www.christinahenri.com.au for more information. 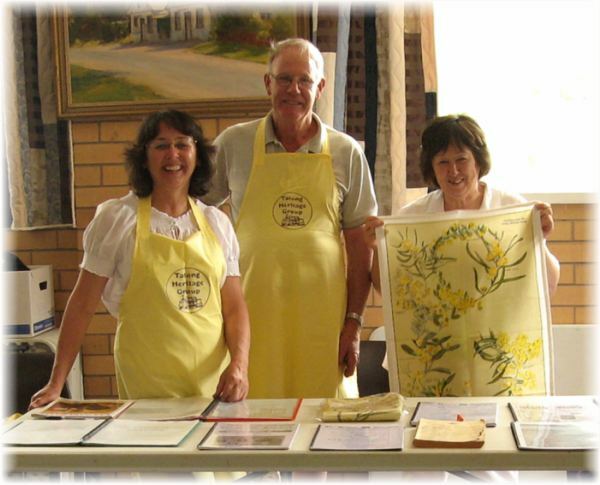 The Tatong Heritage Group are celebrating women's suffrage in support of the Women Convicts Project, currently taking place in Geelong and Tasmania. The project aims to have 25,000 bonnets made, by descendants of female convicts. This commemorates the 25,000 women who were sent to Australia as convicts during this nation's early history. Each bonnet bears the name of the female convict ancestor of the maker. If you have no convict in your past, you can adopt one. The bonnet also bears the name of its maker. 2007 was 50 Years since electricity came to Tatong! The original "Switching-On" ball, planned to celebrate this on 7th February 1957, was nearly postponed as 4 French Island escapees were at large in the Tatong area. One was caught in the school (by a local, Bob McEwen), and on the 7th, the remaining three were caught in a hut on Tiger Hill rd. Word went out, "They are caught, so come to the Ball". The "50 Years since Switching On" Ball, held in the new Tatong Hall on Saturday July 7th 2007, was a romp. Thanks to all who put in time and effort to prepare the hall and run the event. Thanks and congratulations also to the Black and White Orchestra, who are celebrating their 50th this year. 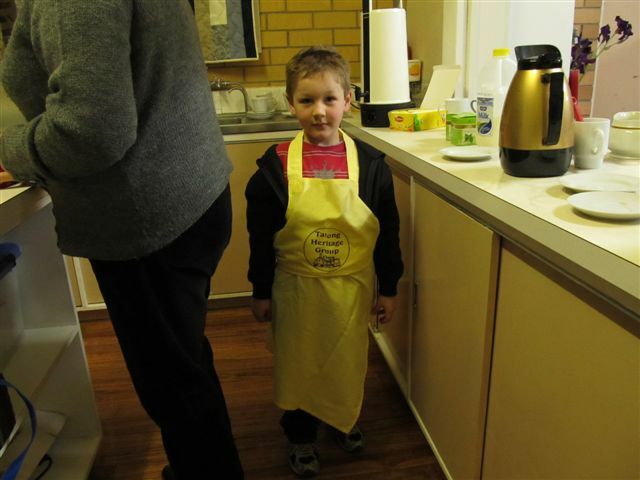 Picture Australia offers a search of many significant online pictorial collections. A search with the word "Tatong" brings up quite a few old photos, including this one by W. H. Ferguson, taken around 1890. Entitled "Tatong picture", it is now in the possession of the State Library (and reproduced here with their kind permission). It was published in the February 06 issue of the Tattler, challenging readers to identify what part of Tatong is portrayed. Despite the relatively indistinct skyline, several people have recognised the place. It took Andrew Wallace's photographic skill to capture this modern version. This view can be seen from Tiger Hill Road, about 1.5km up from Tatong, looking North. Even walking about with the 1890 photo printed on a transparency, an endeavour to find the very spot where the first photographer stood has so far failed. The creek-line has no doubt changed. 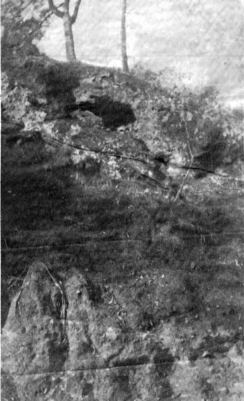 The original photographer may have stood on top of the hill on the South side of Tiger Hill road, or on what it now Wayne Lewis's property, North of the road. Wayne recalls that the hill had been owned by a Mr Monaghan, prior to his father buying that piece of land. 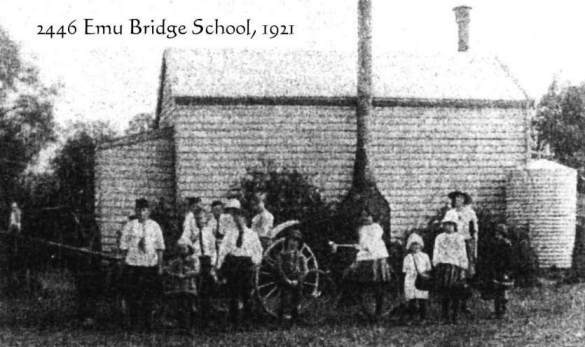 Thanks to the State Library of Victoria for permission to freely use the picture, both in the Tatong Tattler and on the Tatong Heritage Group's website. Thanks also to Andrew Wallace for the 2006 version. Perhaps in time a picture showing both the old and the new will be prepared. Melbourne Uni is helping Benalla recover rich legacy in early photographs. 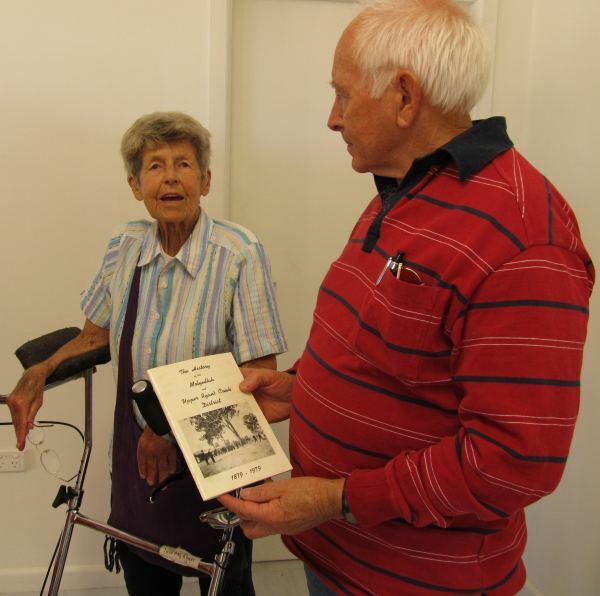 A collection of photos documenting Benalla and surrounding district will be made available through the University of Melbourne Archives in partnership with the Benalla & District Family History Group. 1,250 dry plate glass negatives were created by Benalla-based professional photographer William John Howship between 1904 and 1931. On Saturday, 11 March, 2006 over 300 people came to help celebrate the unveiling of the plaque and storyboard, and a great day of past & present Tatong. 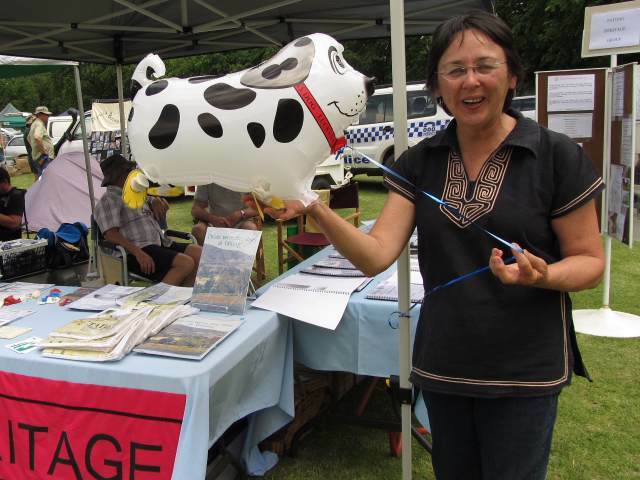 Rod Lindsay has finished his "bogey", and it is now a centrepiece for Tatong. 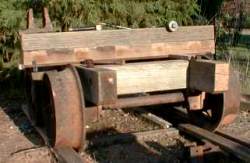 This was the kind that, attached to a log, turned the log into a trolley. 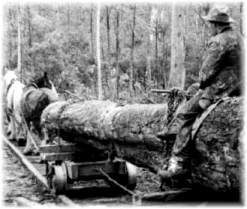 They were used to cart logs from the Tatong hills to the sawmill, then to cart the sawn timber from the sawmills to the railway. 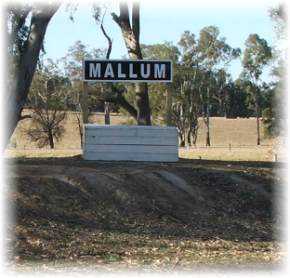 All four signs are now up, marking the station sites on the one-time Benalla-Tatong railway line. The signs are in the same style as the originals. And the Tatong Young Bloods put in some hard yakka on a different relict of Tatong Transport. 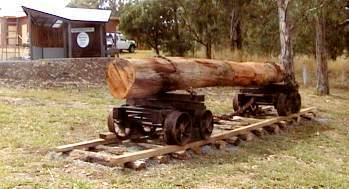 The timber tram-lines, which once carried timber to the mills, are in some places being overgrown by the bush. 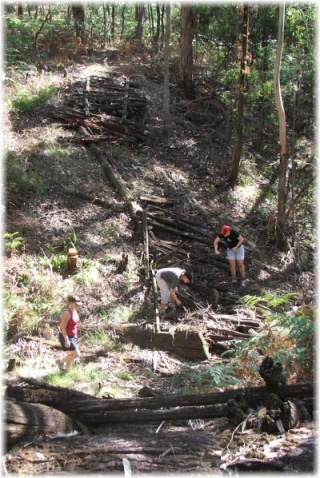 In April the Young Bloods worked to clear growth and bush litter. Who was buried at the Elm Tree Corner? It is known that a creamery was there. It is also recorded in oral history that either one woman, two women, or a man and a woman (or all of these) were buried there. The Elm Tree Corner is the first of the White Gate right-angle bends encountered when coming from Benalla. WANTED! 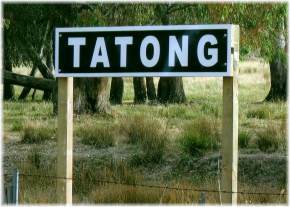 The original Tatong Railway sign. 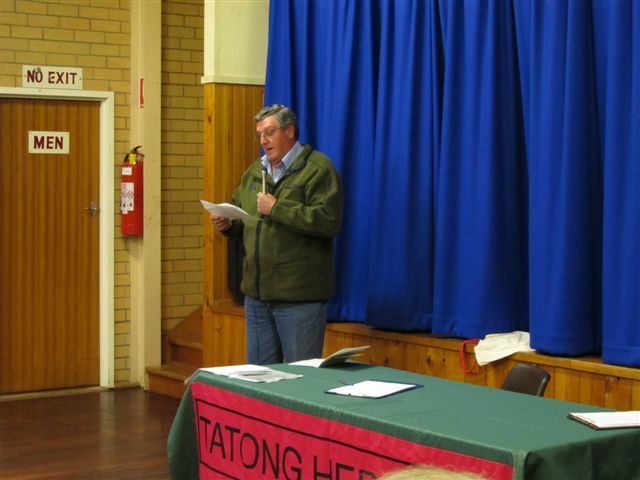 Also wanted; any information or pictures of Tatong & districts heritage. The Tatong Heritage Group meets bi-monthly, to consider projects, funding, and avenues of investigating, collecting, and securing items and knowledge of Tatong's heritage. 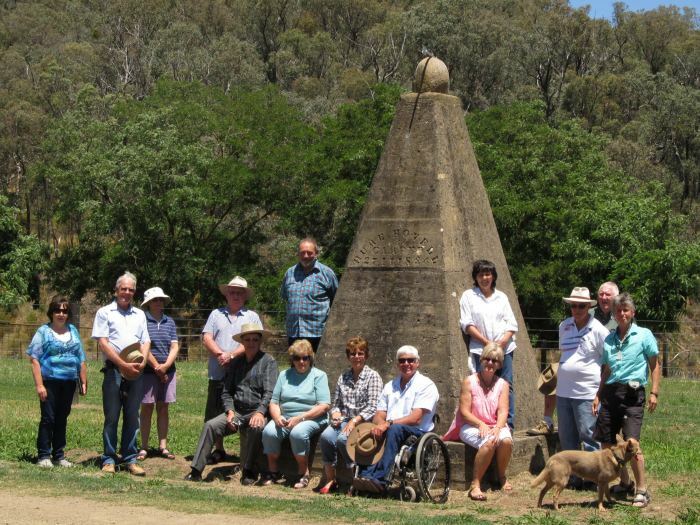 There is a Parish of Tatonga in the County of Benambra, adjoining the county of Bogong. A township named Tatonga was gazetted, apparently at the junction of Jarvis Creek and the Mitta Mitta – if it ever existed, it would now be part of Lake Hume (Tatonga Parish Map). 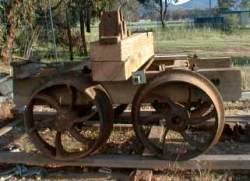 Instead of Tatonga, Tallangatta seems to have come into being, in the 1870s. There was a Tatonga railway station (opened July 1891, closed March 1981) on the Cudgewa railway line, Victoria. Today there is nothing left of the station, and the railway line is becoming the High Country Rail Trail. 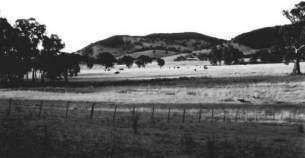 "Tatonga Inlet" comes South off the Hume Reservoir about 7km East of present day Tallangatta. Tatong is a small township in North Eastern Victoria, Australia. 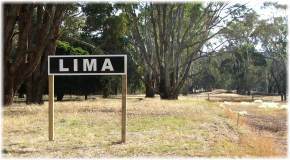 It is 28kms SE of the larger regional town of Benalla, on bitumen road, . The hill town of Tolmie is further South East, mainly by gravel road, travelling past "Stringybark Creek", where Ned Kelly had a bit of a turn-up.